Santa got a lot cooler in the off-season. Seeing "A Christmas Carol" every few years is pretty much a holiday requirement. This year you can catch it at Ford's Theatre (511 10th St. NW) and witness Ebenezer Scrooge's transformation from cruel and miserable to pretty much just hurling turkeys at poor people. In a nice way. Acclaimed Washington stage actor Edward Gero will also be returning to play Scrooge. Nov.18-Dec. 31; $45-$75. Don't miss the much-anticipated "Christmas Celebration" play at Evangel Cathedral (13901 Central Ave., Upper Marlboro, Md.) to see performances by Grammy and Stellar Award-inning artists BeBe and CeCe Winans, Donnie McClurkin, Marvin Sapp and many more. You'll see a living nativity, dance performances and dramatic imagery and vocals executed by a cast of more than 200. Dec. 3-18; $65-$85. Encore Theatrical Project’s holiday musical “Santa’s Special Delivery” combines award-winning choreography, outstanding costumes and humor all wrapped into a Broadway-style play. Nov. 25-26 at Hylton Performing Arts Center (10960 George Mason Circle, Manassas, Va.); Dec. 10-18 at Richard J. Ernst Theatre (8333 Little River Turnpike, Annandale, Va.); $15-$30. Catch the kid-friendly play "Twas the Night Before Christmas" at Adventure Theatre (7300 MacArthur Blvd., Glen Echo, Md. ), which takes a new spin on the classic poem by Clement C. Moore. This time, a mouse is stirring -- because Santa missed his house last year. This kid-oriented holiday play comes from Tony nominee and Olivier Award-winning playwright Ken Ludwig. Nov. 18-Jan. 2; $18. 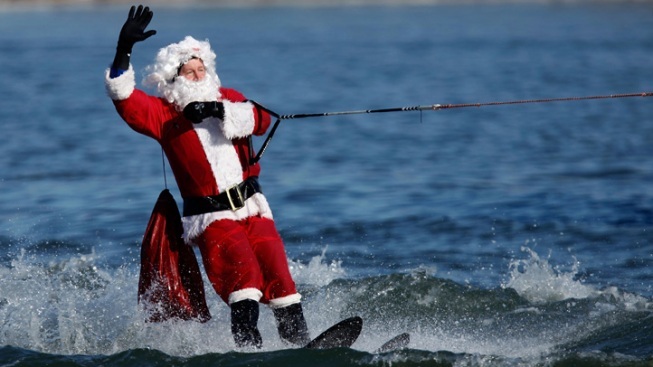 Witness a one-of-a-kind D.C. at the National Harbor, when Water-Skiing Santa arrives. Bring the whole family and watch Santa, flying(!) elves, the Grinch and Frosty the Snowman skim along the surface of the Potomac. Dec. 24 at 1 p.m.; free.